Beginning in the 2014 model year, Toyota introduced the 1794 Edition Tundra, named after the year Spanish colonist Juan Ignacio de Casanova established the JLC ranch, Texas’ oldest working cattle ranch and the land upon which Toyota’s Tundra plant currently resides in San Antonio. 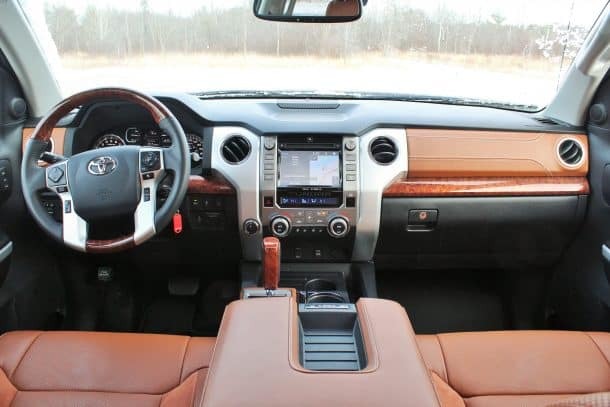 The 1794 Edition Tundra is a premium truck appointed with luxury features like saddle brown leather seats that are heated, cooled and powered, wood trimmed steering wheel and dash, a power sunroof, blind spot monitoring, an Entune Premium JBL sound system with a navigation system, unique 20″ Alloy wheels and of course the signature 1794 Edition badging. In the class of other luxury trucks like the GMC Denali, Silverado High Country, Ram Laramie, and the Ford King Ranch, the Tundra 1794 Edition rises above with a combination of Toyota’s reputation for reliability with good ‘ol American-made quality. Galaxy Toyota in Eatontown NJ has your 1794 Edition Toyota Tundra in stock and ready to test drive today. Come see this extraordinary truck at a great price! Navigation, Heated/Cooled Leather Seats, Sunroof, Premium Sound System, POWER TILT & SLIDE MOONROOF W/SLIDING... Trailer Hitch, Alloy Wheels, Back-Up Camera. SUPER WHITE exterior and BROWN/BLACK interior, 1794 Edition trim CLICK NOW!======KEY FEATURES INCLUDE: Leather Seats, Navigation, 4x4, Heated Driver Seat, Cooled Driver Seat, Back-Up Camera, Premium Sound System, Satellite Radio, iPod/MP3 Input, Bluetooth, Trailer Hitch, Aluminum Wheels, Dual Zone A/C, Blind Spot Monitor, Brake Actuated Limited Slip Differential MP3 Player, Keyless Entry, Privacy Glass, Steering Wheel Controls, Child Safety Locks. ======OPTION PACKAGES: POWER TILT & SLIDE MOONROOF W/SLIDING SUNSHADE. Toyota 1794 Edition with SUPER WHITE exterior and BROWN/BLACK interior features a 8 Cylinder Engine with 381 HP at 5600 RPM*. ======EXPERTS RAVE: Edmunds.com's review says Side to side, front and back, headroom and legroom you name it, there's lots of it everywhere.. ======VISIT US TODAY: Here at Galaxy Toyota one of the NJ Toyota dealers our mission is treat every visitor like an honored guest in our home but to the great Toyota customers we serve it is much more than a mission statement. Our New Jersey Toyota customers quickly learn that shopping at Galaxy Toyota means being treated with respect, not having to negotiate or visit multiple New Jersey Toyota dealers to get the price you deserve. Horsepower calculations based on trim engine configuration. Please confirm the accuracy of the included equipment by calling us prior to purchase.